Keeping your dog cool during the hot summer months requires some planning and good old common sense. Here are few reminders to keep your dog safe in the heat. Offer a Cool Environment - Keep your house cool on hot days. If you need to leave you dog home, leave the air conditioner on for them. Offer a wet towel to lay on if your house is warm. Plan Ahead - Early morning or evening is the best time for walks or exercise. Watch the humidity level, high humidity can distress a dog even when the temperature is not excessive. Walking Your Dog – if you need to walk your dog on pavement, put your palm on the pavement in a sunny area, if it is too hot for you it is too hot for your dog’s pads. Consider using dog boots or a wax protectant on your dog’s pads. Bring a collapsible water dish and plenty of fresh water on your walks. Giving Your Dog a Safe Environment in Your Yard – make sure your dog has someplace to go to get out of the sun. If your yard does not have much shade try hanging up a shade screen or tarp. Beach umbrellas are also an alternative. A small kiddie wading pool with shallow cool water is a good for keeping your dog’s pads cool. Be sure to provide plenty of cool water to keep your dog hydrated. Finally, a garden hose mister is a great way to keep your pet cool and lower the air temperature near the hose. Keep Your Dog Well Groomed – make sure your dog’s coat is free from all tangles and mats. Talk to your groomer about the proper hair cut for your dog. Not all dog do better with a shorter or clipped coat. Keep Your Dog Hydrated – keep your dog well hydrated. Add ice cubes to the water dish to keep the water cooler and try giving your dog some frozen treats. Replace a portion of their regular diet with canned food. Canned food contains more water and will help in hydration. Try a Cooling Protein Source – most dog foods are chicken based, which is a warming protein. Try using a cooling protein source like rabbit, whitefish, Pollock or duck. Your dog does not have to work as hard to digest these protein sources. Signs of Overheating – keep an eye out for these signs in your dog, they are good indication that your dog is in distress and needs immediate attention. 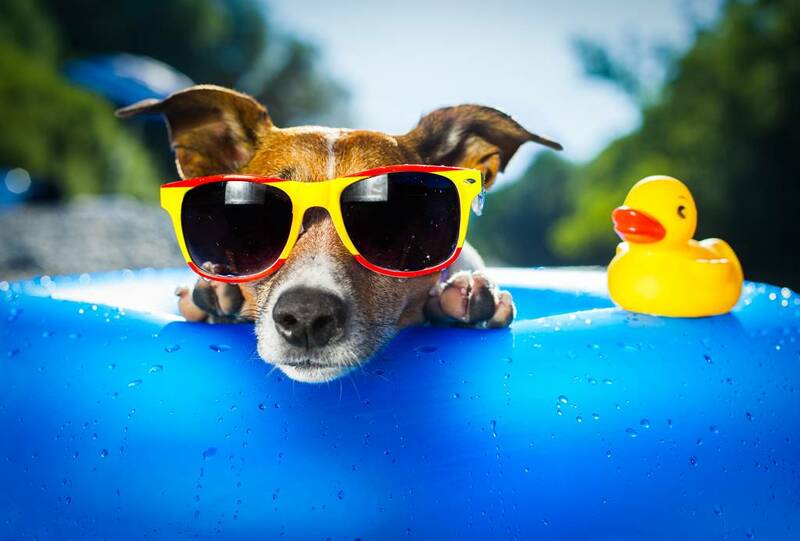 How to Cool Your Dog Down – ALWAYS use lukewarm or slightly cool, NOT cold, water to cool your dog. Gradually cool your dog down and NEVER use an ICE bath. Using ice will restrict the capillaries in the blood vessels which will prevent the internal organs from cooling down. Using a wet towel start from the bottom up. If possible use a wading pool to cool the dog’s paws. You can use rubbing alcohol on their paws to help the cool down (the alcohol will evaporate as it dries lowering the temperature). Cooling the inside flaps of the ears with a damp towel also helps. Be sure to give your dog plenty of water. Be sure to seek medical attention as soon as you can to have your dog examined if you think they suffered from heat stroke.